Having all the nice maps features in the desktop, tablet and phone apps, there remains one problem: where to find all the GPS coordinates for your existing dive sites in your logbook? When going to a new dive site you can take a GPS device with you, but that doesn’t help for your existing dives. 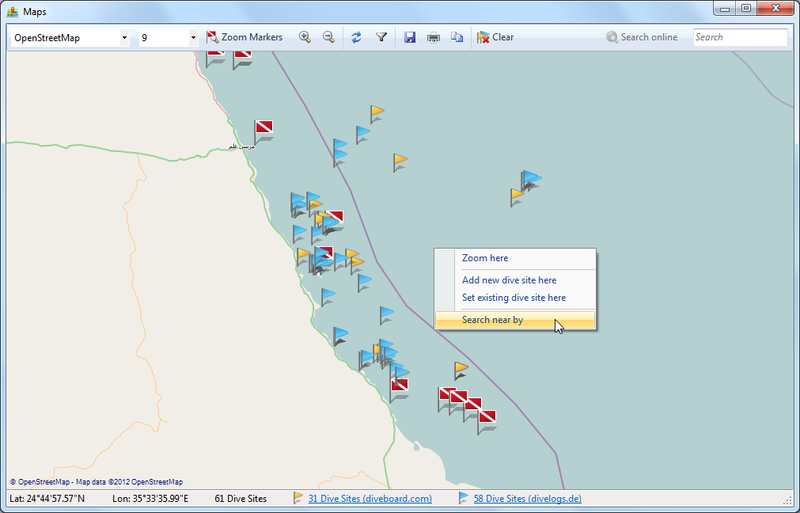 This is getting a lot easier: in the maps window in Diving Log 5.0, you can now search 2 online sources, divelogs.de and diveboard.com. Type a dive site name into the search box in the upper right corner – this will filter your existing dives in your logbook. 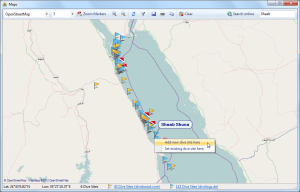 When you click the new “Search online” button on the left side, Diving Log will query dive sites from the 2 online logbooks and display the results as yellow and blue flags on the map. When you left-click on a site flag, you can import it into your logbook. I recommend that you activate the satellite view to find the best matching flag as there is no guarantee that a position is correct. When you know roughly the area where a dive site is located, you can right-click into the map at the approximate position. When you click on “Search near by” in the context menu, all sites around that location will be displayed. Both methods are a great way to find new spots which are currently not in your logbook. All dive sites were created by users who upload their dives to the online logbooks. The Diveboard.com synchronization will be finished soon and I’ll provide a beta version, so you can test the logbook sync as well as the dive site search in the map window. This entry was posted on Sunday, December 16th, 2012 at 11:17 pm and is filed under Diving Log 5.0. You can follow any responses to this entry through the RSS 2.0 feed. Both comments and pings are currently closed.